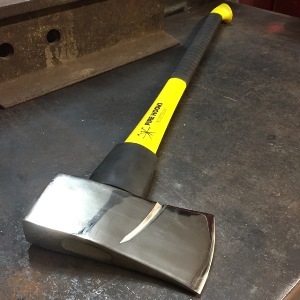 The Lock-Slot 8 Forcible Entry Axe is a perfectly balanced force axe in the hands of a firefighter for striking the MAXIMUS Forcible Entry Halligan Bar. The Lock-Slot 8 features a drop forged head of high carbon steel, rockwell heat-treated and coated with anti-rust zinc plate. The "marrying slots" lock the MAXIMUS to the axe for easy carry by one hand - no straps needed. To quickly release from the married position, simply tap the handle on any surface. 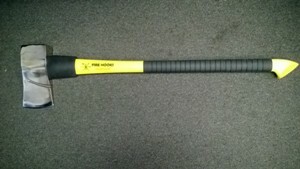 The Lock-Slot 8 handle has a yellow triple strength fiberglass handle with a deer's hoof knurled bottom grip and thermo rubber grip.